for the third time in about a month, my forge return has posted with a bogus transaction id and i never received the funds. @nealzor Hi. I sent you a reward https://explorer.arknode.net/tx/1ca89586505a53309ad6e99d4069561be81729b1ce0963b193cca9b0bc362d60 . If the user is not contacted for two days. A reward will be automatically sent on his address. @mr.Escanor awesomeee! I’m the second place. how do i contact you directly for the following steps? Already recieved the prize! Great job sharkpool. Keep the good work! Dear friends, the contest is postponed to March 31 . The contest will be played 230 ARK! 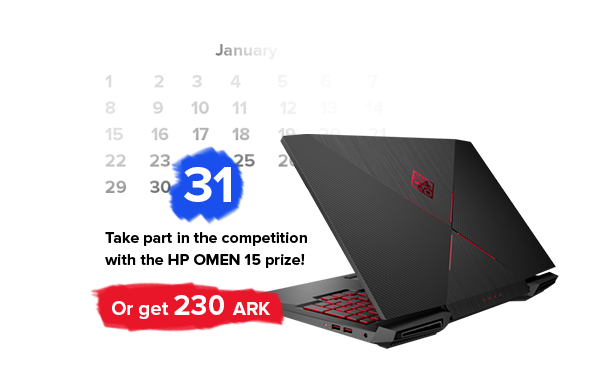 Now every two months, will be the main prize “new laptop HP OMEN 15” or the winner will be paid the equivalent amount of the prize, which means that the first place will be sent 175 ARK. @mr-Escanor Hi, I received a payment of 4.9 Ark (plus 0.1 fee) 10 days ago so I thought I’ll get 12h payments from then on, but I haven’t. Did I misunderstand how the payout system works? Do I have to earn full 5 Ark, excluding fees, to be eligible for the 12h payments? Thanks! @cryptogri hi, please tell me your address.